Champagne, and all wines with bubbles, falls under a broad category known as Sparkling Wine, but Champagne specifically comes from the famous wine region in France of the same name. It is made by the traditional labor and time-intensive method known as méthode champenoise. In addition, the grapes that make genuine Champagne are limited by French law to chardonnay, pinot noir, and pinot meunier. Through international trademark law, it is no longer legal to identify a sparkling wine that is made outside the Champagne region of France as “Champagne.” A few American producers, through “grandfathering” rules, are permitted to label their sparkling wine as Champagne if they choose to. Some will opt to use the more generic term Sparkling Wine. There are no restrictions in the US as to the types of grapes that must be used in these wines. Sparkling wines around the world are identified with the country’s own term for sparkling wine. For example, in Spain it is labeled Cava and in Germany it’s known as Sekt. 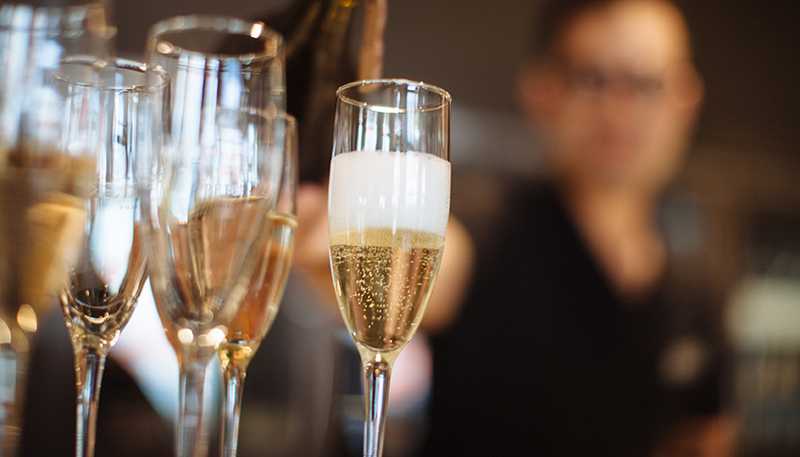 Italy calls it Spumante and in France, when outside of its Champagne region, a sparkling wine is identified as Crémant. Méthode champenoise, or “fermented in this bottle,” is an indication that the wine was made using the traditional Champagne-making method, widely acknowledged to produce a superior style of sparkling wine – albeit at a higher cost. Using méthode champenoise, California produces some world-class sparkling wines that are bright and crisp with a delightful level of acidity. Most offer subtle flavors of apple, pear, and sometimes a mild “toastiness” that originates from the yeast of the second fermentation that occurs inside the bottle and creates the bubbles.